Some years ago I attended a presentation of John Scott in which he demonstrated the use of substitution for producing a string from a number of variables. Even a relative simple expression like this is hard to read. Moreover it is not easy to see whether the quotes are placed at the right position and quantity. This code is much more readable and the html can be checked easily. I have been using this design pattern a lot since then. But the typing annoys me. Typically something to automate! So this morning, when I was getting ready to type a list of replace statements for the 1001st time I decided to create a small tool to generate these lines. 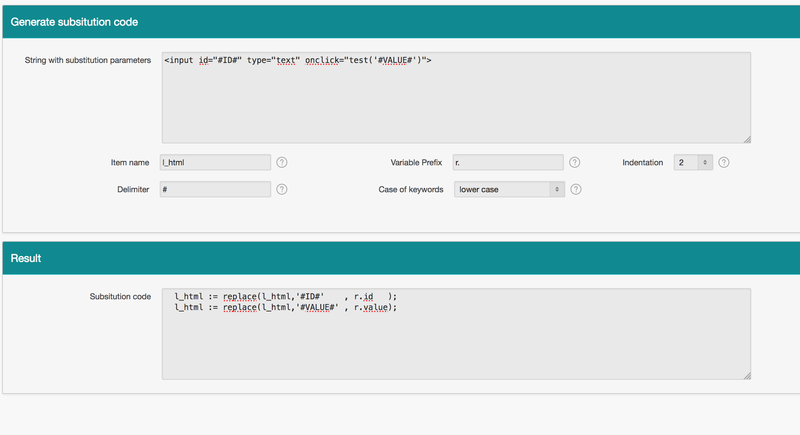 Paste the string with placeholders into the form and change the other parameters to your preferences. Press generate and you can copy the resulting code into your PL/SQL. The generation presumes that the names of the variables containing the values to be replaced are equal to the placeholder names. Doing this also improves the readability of the code.